When Apple held its last big keynote, it unveiled some new iPads, just like we knew it would. But it also used the 80-minute news conference to refresh its Mac lineup, announcing a new Mac Pro desktop and some slimmed-down MacBook Pros, all running Apple's brand-new operating system, OS X 10.9 Mavericks. In particular, the MacBook Pros sort of flew under the radar that day, mostly because they look more or less like last year's models, just with slightly thinner chassis. There wasn't a lot to say -- at least not after a few minutes of hands-on time. That doesn't mean this isn't a meaningful upgrade. This time around, as you'd expect, Apple used Haswell processors, though it also went with Intel's brand-new Iris and Iris Pro chipsets, which haven't actually been used in that many notebooks yet. Meanwhile, Apple moved to PCI Express SSDs for much-improved transfer rates, and upgraded the wireless card to 802.11ac for faster streaming. Sounds like a simple sales pitch: They're thinner, lighter and speedier. And, in the case of the 13-inch model, it's cheaper too: The starting price is now $1,299, versus $1,699 a year ago. So does that mean the 13-inch Retina display MacBook Pro offers better value than it did then? More importantly, with a lower price, lighter design and a claimed 10 hours of battery life, is it starting to veer into MacBook Air territory? Thanks to a lower price, longer battery life and lighter design, the 13-inch Retina MBP is a better deal than it was a year ago. It's so compelling, in fact, that you might even choose it over the Air. 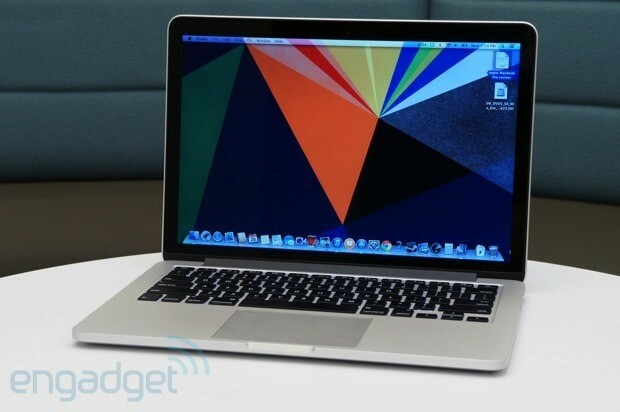 How would you rate the MacBook Pro 13-inch with Retina Display (late 2013)? 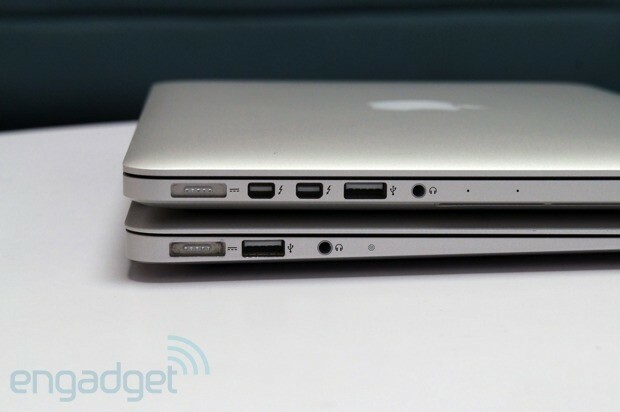 The first generation of Retina display Macs lived in the cracks between the MacBook Air and the old MBPs. They were deliciously thin, yes -- especially compared to the legacy models -- but you would never have mistaken the 13-inch one for an Air. To be honest, you still wouldn't, but on the continuum that separates the Air and MacBook Pro, the 13-inch Retina model is starting to look more and more like an Ultrabook. Mostly, it's the thickness. It measures 0.71 inch thick, down from 0.75 inch on last year's model. That puts it within spitting distance of the 13-inch Air, which measures 0.68 inch at its widest point. Really, if you were to stack them one on top of the other, you'd only be able to tell the difference because of the Air's signature wedge shape. 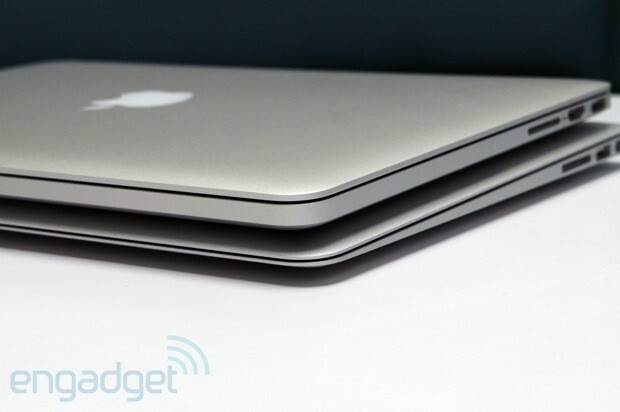 And that's more of a cosmetic flourish than anything else; it's not like the MBP is a fatso or anything. Well, not a fatso, but it is noticeably heavier at 3.46 pounds, compared with 2.96 for the Air. Still, it's a clear improvement over last year's model, which weighed 3.57 pounds. All told, the new Pro is light enough that I was easily able to tote it around in my pack for a weekend without any strain. The build quality is also just as sturdy as you'd expect from a Mac. At the same time, it's still noticeably heavier than the Air, both in a backpack and in the hand. We know, we know: This all sounds dreadfully obvious. But listen carefully because this trade-off is ultimately going to decide your purchasing decision: Given that these two machines cost about the same and each deliver long battery life, you're only going to pick the heavier one if you need the spectacular graphics performance. That, or the wider port selection. 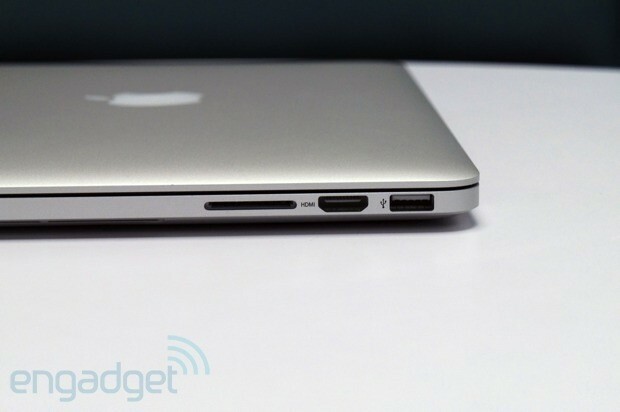 Step up to the Pro and you'll get two USB 3.0 ports, along with a full-sized HDMI socket, SDXC card reader, a headphone jack, dual Thunderbolt 2 ports and a MagSafe 2 connector. Aside from the move to Thunderbolt 2 from regular, old Thunderbolt, this is the same selection of ports as on last year's model. As ever, too, the port selection is exactly the same on the bigger 15-inch version, so it's not like you gain anything by moving up in size (except for, you know, more screen real estate). Lift up the lid, and you'll see the MBP sports the same island-style keyboard as the last generation, with springy, well-spaced buttons and a strong white backlight emanating from underneath. As ever, too, the Pro's glass trackpad is smooth and flawless, with precise tracking and fluid handling of all your favorite multitouch gestures. Incidentally, when we installed Windows 7 on a separate partition, the trackpad worked just as well in Windows as it did in OS X. Although the MacBook Pro's Retina display is important enough that it belongs in the headline, it's nothing you haven't seen before. This is the same 2,560 x 1,600 IPS display used in last year's model, and it's as lovely as ever. Color reproduction is good; viewing angles are wide; and individual pixels are, indeed, impossible to make out when you're sitting a natural distance from the screen. Even if the resolution was lower and we could spot some pixels, it would still be a nice panel, thanks to the very low-glare finish. Throughout testing, I used the MBP in a variety of lighting conditions, from a harshly lit office to an airplane seat, with sunlight streaming through the window next to me. Regardless of the situation, I could easily read the display. And when I found myself dipping the lid forward while working on an airplane tray, I could still follow along with everything on the screen. There's nothing we'd change about Apple's Retina display. We just can't pretend it's alone in its class. When we reviewed the first generation of Retina display MacBook Pro, we complained that not all applications were optimized to take advantage of that 2,560 x 1,600 experience. While we've hardly surveyed every program in the Mac App Store, we found that every app we installed scaled gracefully to full-screen so that they weren't blurry, and none of the objects looked disproportionately tiny (two different problems we've found with super-high-res screens). Everything here looks sharp and, for lack of a better term, "normal-sized" at full-screen. That means you won't get any additional screen real estate because of those extra pixels, but at the same time, most apps look like they belong there. All in all, this is still a stunning screen, though it feels less novel than it used to. That's partially because it's the exact same screen as on the last generation, and partially because Apple's competitors have started to catch up. Take Samsung, for instance. The company's new ATIV Book 9 Plus Ultrabook rocks a 13-inch, 3,200 x 1,800 screen that rivals the Retina display in both resolution and viewing angles. Lenovo's new Yoga 2 Pro has a 3,200 x 1,800 panel as well. Acer's Aspire S7 is also available with a 2,560 x 1,440 display option, albeit not in the US. And that's not even counting models that haven't come out yet. All that being said, there's nothing we'd change about Apple's Retina display -- it's simply a gorgeous screen. We just can't pretend it's alone in its class. As before, the speakers sit beneath the keyboard, with no obvious openings. The volume itself still gets decently loud, and the quality is balanced enough for casual listening (I had Pandora to keep me company as I wrote most of this review). Still, being the thin-and-light laptop it is, it's still predictably a bit weaker with bass notes than a heartier system would be. While the 13-inch Retina display MBP starts at $1,299, we tested the $1,499 version, which packs 8GB of RAM, a 256GB SSD and a dual-core, fourth-generation Core i5 processor, clocked at 2.4GHz. Additionally, it's one of relatively few systems to make use of Intel's new Iris graphics, which promises to be a touch stronger than the Intel HD 4400 chipset usually found in Haswell laptops. Indeed, the graphics are robust enough that we were able to play Batman: Arkham City (the Game of the Year edition) at max resolution with relatively little stuttering. With the detail level set to "medium" and anti-aliasing at a medium setting of 4x, we logged an average frame rate of 24 fps, with frame rates running the gamut from 18 fps to 31 fps, depending on what scene we were playing. Even then, the action was fairly smooth, though there were a few instances when we noticed gameplay briefly slowed down. Fortunately, disabling anti-aliasing more or less solved the problem: Once we did that, average frame rates climbed to a more playable 32 fps. So, our outlook for gaming is good, given that this is actually one of the more graphically demanding titles and it still managed to run decently well. As it happens, it was only when we were playing games or running graphics benchmarks that we heard any fan noise. Even then, we couldn't hear the sound over the music from our game, though if you're attempting to, say, edit video in silence, you might notice the machine getting a bit loud. Thankfully, even when the fans started to spin, they quieted down again just a minute or two after we closed out of our full-screen gaming session. What's more, though the keyboard and bottom side started to heat up, they never got more than lukewarm. So at least you know that fan noise isn't for naught; the ventilation system does a good job of keeping the system cool. The other big change here, aside from that big graphics bump, is the move to solid-state drives based on the PCI Express standard. Compared with the mSATA drives used in last year's models, Apple is claiming up to a 60 percent boost in disk speeds, with transfer rates as high as 775 MB/s. Sure enough, using the Blackmagic disk benchmark, we saw average reads of 731 MB/s and average writes of 673.5 MB/s (note: We ran the test with workloads ranging from 1GB to 5GB, and repeated the test around 10 times on each setting). Additionally, after installing Windows 7 on a separate partition, we ran ATTO, the benchmark we use to test transfer speeds on Windows machines. On that test, we actually got even higher read rates, with rates climbing as high as 823 MB/s. However, write speeds were more consistent with what we found on the Mac side, with a high of 686 MB/s. Also, between adding a Haswell processor and PCIe SSD, Apple was also able to shave a few seconds off the boot time -- the MBP now takes 11 seconds to cold-boot into OS X, down from around 15 last year. Otherwise, CPU performance isn't much better here than it is on the current MacBook Air, or any other Haswell Ultrabook, for that matter. Which makes sense: We already know that Intel's fourth-generation Core processors provide a bigger boost in battery life and GPU strength than they do on CPU performance. You can see that in the modestly better Mac benchmark scores (see that first table above), which show just a small improvement over the Air on CPU tests. Additionally, as we said, we installed Windows on a separate partition, where we ran the same tests we normally run on PCs (precisely so that we could compare the performance more directly). As you can see in the table directly above, the CPU performance is strong, but not out-of-this-world strong; the Acer Aspire S7 turned in similar scores, and some other machines like the Samsung ATIV Book 9 Plus are only a few hundred points behind in PCMark 7. All told, the biggest difference is in graphics performance, but you already knew that. The 13-inch MacBook Pro with Retina display is rated for up to nine hours of battery life, compared with seven hours on the non-Retina model. As it turns out, though, that's actually a rather conservative estimate: We were able to eke out an impressive 11 hours and 18 minutes of continuous video playback. Mind you, that was with some pretty taxing system settings, including auto-brightness off, display brightness fixed at 9/16 bars (no dimming), the screen saver turned off and instructions to never put the disk to sleep. So, the battery life is even better than expected -- not to mention, better than on last year's model, which only managed 6:07 on the same test. Then again, we can't say we're that surprised: Haswell has been known to dramatically improve battery life. Also, Apple has a history of making conservative battery life claims on its website (see: the original iPad mini and the most recent MacBook Air, both of which lasted longer than expected). In case you were wondering, we also ran the same video-looping test on the Windows partition, with the power-management settings set exactly the same as on any PC we test (brightness at 65 percent, no dimming, WiFi on, machine never goes to sleep, et cetera). Under those conditions, the battery lasted seven hours and 47 minutes. This, too, is unsurprising: Macs are obviously optimized for OS X, and indeed, the battery life is always better on that side. The new MacBook Pros went on sale the same day OS X 10.9 Mavericks became available to download in the Mac App Store. Obviously, then, our review unit came with the new software installed, and whatever machine you buy will too. For a full rundown on what the (free) OS update brings, we encourage you to check out our full review. (Spoiler: We recommend you download the upgrade. It is free, after all.) For those who don't have time to read 4,000 words, though, here's a recap: The update brings desktop versions of iBooks and Maps, tabs and tags in Finder, improved support for external displays and battery life-saving features like App Nap. Additionally, iLife and iWork are now free with the purchase of new Macs (you'll still have to download them, though). Apple's never had a particularly generous standard warranty, and the new Retina display MacBook Pros are no exception. Included with your purchase, you get one year of coverage, along with 90 days of free telephone support (compared with at least a year on most Windows PCs). For $249, you can extend the warranty to three years. This stretches the free-phone-support period to three years as well. The 13-inch Retina display MacBook Pro sells from $1,299 -- a big drop from last year's models, which started at $1,699. On the base model, you get a 2.4GHz Core i5 processor (the same one we tested), along with 4GB of RAM, Intel Iris graphics and a 128GB PCIe SSD. For $1,499, it comes with the same processor, but double the RAM and storage space (so, 8GB with a 256GB SSD). Finally, the top-end model retails for $1,799 with a slightly faster 2.6GHz Core i5 processor, 8GB of RAM and a 512GB SSD. If you're upgrading from the lowest-end model, you can opt for that 2.6GHz Core i5 processor we mentioned ($100) or even a dual-core 2.8GHz Core i7 CPU ($300). Other add-ons include 8GB or 16GB of RAM. (The eight gigs of RAM is a $100 upgrade; the 16GB either costs $200 or $300, depending on whether you're upgrading from the lowest-end model or one of the higher-end ones.) You can also step up to 1TB of solid-state storage, but you can only do that if you select the top-end, $1,799 model. In that case, it's a $500 upgrade. 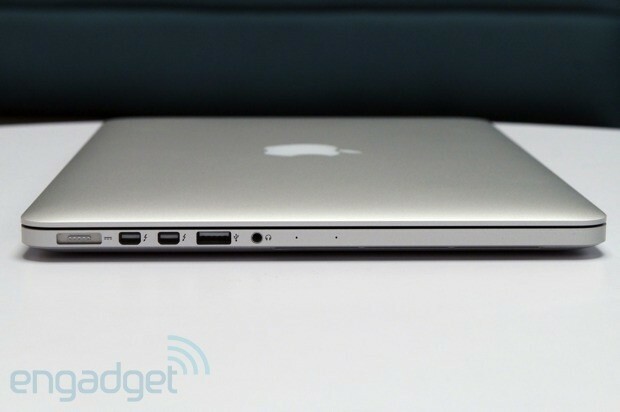 While we're at it, we may as well break down the 15-inch Retina display MacBook Pro too. As ever, this guy's significantly more expensive, with a starting price of $1,999. For the money, at least, you get much-improved specs: a quad-core 2GHz Core i7 processor, 8GB of RAM, 256GB of solid-state storage and Intel Iris Pro graphics. For $2,599, it comes with a faster 2.3GHz Core i7 processor, 16GB of RAM, 512GB of storage and dual graphics: Intel's Iris Pro chipset, along with a 2GB NVIDIA GeForce GT 750M GPU. Ready to customize? If you select the cheaper model, a 2.3GHz Core i7 processor will cost you $100; a 2.6GHz processor is also available for $300. Moving up to 16GB of RAM will set you back $200. 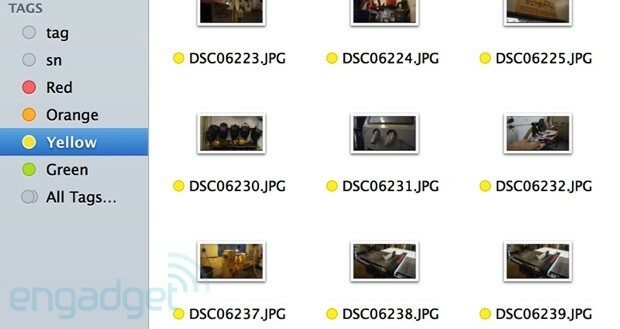 You can also increase the storage to either 512GB ($300) or 1TB ($800). Obviously, if you've already selected the $2,599 configuration, you'll have fewer opportunities to upgrade, but there are still a couple options here. Namely, you can step up to that 2.6Ghz CPU ($200 in this case) or 1TB of storage ($500 when upgrading from the higher-end model). Finally, it's worth mentioning that the classic 13-inch MacBook Pro (read: the one without a Retina display) is still around, though Apple did quietly axe the 15-inch version. Tellingly, Apple's made the full spec list harder to find, and the classic version occupies but a narrow sliver of screen real estate on the "Buy" page. 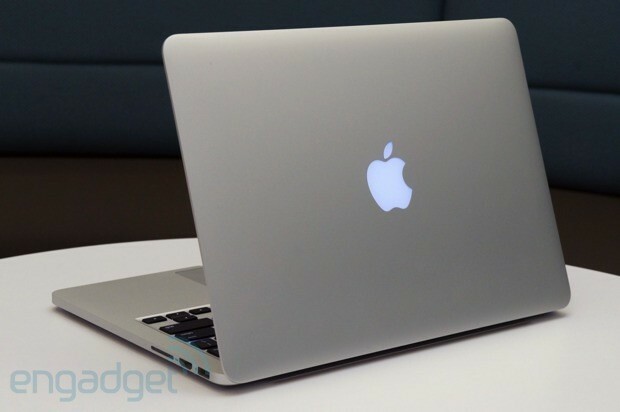 Most importantly, it's priced just $100 below the 13-inch Retina model, at $1,199. Message received: Apple would prefer we buy a Retina machine instead. And given the price, we suggest you do too. For $1,199, you get a last-gen Ivy Bridge Core i5 processor, 4GB of RAM, a 500GB 5,400RPM hard drive, Intel HD 4000 graphics, a lower-res 1,280 x 800 display and a battery rated for seven hours of run time (compared with nine on the 13-inch Retina MBP, and eight on the 15-incher). For that extra $100 you'd spend on the Retina model, the higher-res screen, longer battery life, newer processor and solid-state storage are all worth it. Also, if you can part with the regular MBP's DVD drive, you'll get a machine that weighs more than a pound less, and is about a quarter of an inch thinner. That's more than a fair trade, we'd say. There aren't many machines that are as light as the 13-inch Retina MacBook Pro, with a screen this sharp and performance this strong. If you can live without the MBP's graphics clout, you'll find a host of Ultrabooks with similar screen quality, battery life and overall speed. These include Samsung's ATIV Book 9 Plus ($1,400 and up) and the Lenovo IdeaPad Yoga 2 Pro ($1,050-plus), both of which we called out earlier for their 3,200 x 1,800 displays. There's also the Acer Aspire S7-392 ($1,400 and up), which is available outside the US with a 2,560 x 1,440 IPS display, though even the standard 1080p panel is quite lovely, if you ask us. Dell's new XPS 15 starts at $1,500 with a 3,200 x 1,800 screen. Similar to the MBP, it can be configured with a Core i7 Haswell processor, 16GB of RAM, 512GB of solid-state storage and NVIDIA graphics -- the same GPU offered in the 15-inch Retina MacBook Pro. The catch, of course, is that this is a 15-inch machine, not a 13-inch one. What's more, Dell's XPS 13 with Haswell isn't on sale yet and when it does arrive, it will have integrated graphics only and a less-sharp 1080p screen (assuming you can even appreciate the difference in pixel count on a display that small). Meanwhile, Lenovo has the IdeaPad Y410p, a compact machine that can be configured with discrete graphics, but it's considerably thicker than the Retina display MBP, and its screen resolution is capped at a less-impressive 1,600 x 900. Finally, though ASUS has been no stranger to compact machines with strong graphics chips, the company has been slow to update its lineup with Haswell, so we're hesitant to call out any of its last-gen offerings right now. On paper, the new 13-inch MacBook Pro with Retina display looks like a marginal upgrade: a CPU refresh with some slight changes to the weight and dimensions. But thanks to a lower starting price, faster SSD speeds and a big leap in battery life, it's actually a much, much better deal than it was a year ago. At this point, it's tougher than ever to say whether someone should get this or the MacBook Air: They're close in price, close in battery life and closer than ever in weight (though the Air is still noticeably lighter). Given how little the Air weighs, you might only want the Pro if you really need that kind of graphics horsepower (or if you prefer the Retina display, which most of us probably do). On the flip side, because it's only half a pound heavier and offers similar battery life, there's less reason to get an Air. It all depends on your priorities, we suppose. Either way, the 13-inch MacBook Pro with Retina display stands as one of the few laptops this size that offers this sharp a screen, this kind of battery life and this caliber of graphics. And we like it even more now that we can afford it.